Well, what a horrible week I’ve had! While the rest of the UK was revelling in the first flushes of Spring and sowing madly, I spent four days last week curled in bed full of the most horrid cold/flu type bug. Suffice to say that very little was achieved in terms of planting, potting or pricking out. 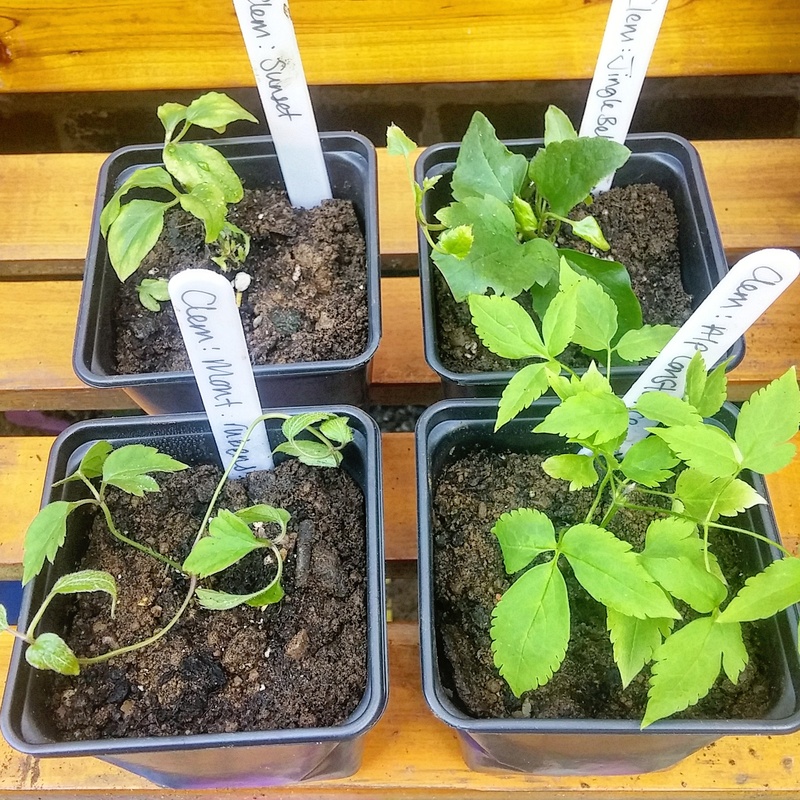 One thing I did manage to get done however was to pot up some clematis plug plants that I got through the post. I was already looking decidedly worse for wear and I didn’t want my young plants joining me in that regard should they be left in their packaging for too long. Clematis cirrhosa Jingle Bells: A vigorous evergreen climber with dark green leaves and pale yellow to creamy white flowers. Flowers in winter and early spring. I’m not quite sure where the best spot for this one would be, thankfully it’s only tiny so I probably have a while to decide. Pruning Group 1. Clematis alpina Constance: A very pretty, tough variety with bell shaped, deep pink flowers and pretty rich green leaves. Flowers in April and May. As this is a variety that does well in a container I’m thinking of growing it up the south facing side of the shed where it’s roots would be shaded by the laurel hedge. Pruning Group 1. Clematis Sunset: A compact, deciduous climber. Produces large, single, deep reddish purple flowers . Also does well in containers. Flowers early to late summer. Pruning Group 2. Clematis montana var. rubens: A pinkish form of the usual white Clematis montana and a vigorous climber. I’m considering pairing this with the Constance in order to cover the shed from April through to June. Flowers in May and June. May also produce a second smaller flush of blooms in late summer. Pruning Group 1. Strawberries have been my favourite fruit since I was little and I cannot envisage this changing any time soon. This is more than likely because their arrival heralds in turn the arrival of my birthday, a day that I am fond of purely for narcissistic reasons (it is for this same reason that I love Wimbledon and become fanatical about tennis for two weeks each year). Being the highest fruit on my list of favourites it was only natural that one of the first building projects on the allotment was to build a shrine of safety for them. When we got the plot last June there was already a good crop of strawberries ripening in amongst the weeds and we managed to harvest a decent amount before the pigeons realised they were there. One of the drawbacks of tackling the weeds was exposing the fruit to all the beady eyed birds that frequent our allotments. The allotment site in general is bordered by trees along two sides and there is a small strip of more robust woodland just to the north of us. This makes for lovely scenery but does mean that pigeons congregate in the trees eyeing up our produce in a way that is reminiscent of vultures following a parched beast through the desert. Our neighbour even warned us that they have been known to purposefully sit on, and weigh down, netting over fruit and veg in order to try and reach their prize. In order to protect this year’s strawberry crop I constructed a raised bed with attached cage to keep the birds away. The cage is 6” x 6” and I can comfortably reach all but the very middle for weeding and other maintenance tasks, fortunately I have an assistant who is a whole foot taller than me and who can be easily bribed with ale to help out, should the need arise. The cage lids are hinged on a central support and lay flush on the surface of the other side so that I don’t risk bashing my head every single time I need to weed, mulch or harvest. The whole thing is secured with chicken wire. The holes in the chicken wire are probably not small enough to keep rodents out, which I only considered once the thing was built, but we’ll have to cross the bridge if we come to it. One half of the bed is currently filled with 9 strawberry plants which were a gift from a friend. They were labelled as Cambridge Favourite which is a mid-season variety. I want to get some late season plants to fill out the other side of the bed so we can keep munching on them for as long as possible. All in all I am quite pleased with my first foray into DIY. Hopefully the multiple times I hammered my own thumb will all seem worth it once June 29th comes around I can enjoy a home grown bowl of my favourite fruit on my favourite day. It will most certainly be a happy birthday to me. It now occurs to me, looking at the list below, that I am perhaps being a tad over ambitious for my first full year on the plot, but I feel that there is undoubtedly just as much to be learnt from throwing yourself in head-first than there is from taking a more cautious approach. I just hope my windowsills can bear the weight of the multitudes of seed trays that are coming their way.